When Charlotte Kinder treats herself to a two-week vacation at Austenland, she happily leaves behind her ex-husband and his delightful new wife, her ever-grateful children, and all the rest of her real life in America. She dons a bonnet and stay a country manor house that provides an immersive Austen experience, complete with gentleman actors who cater to the guests' Austen fantasies. Everyone at Pembrook Park is playing a role, but increasingly, Charlotte isn't sure where roles end and reality begins. And as the parlor games turn a little bit menacing, she finds she needs more than a good corset to keep herself safe. Is the brooding Mr. Mallery as sinister as he seems? What is Miss Gardenside's mysterious ailment? Was that an actual dead body in the secret attic room? And - perhaps of the most lasting importance - could the stirrings in Charlotte's heart be a sign of real-life love? 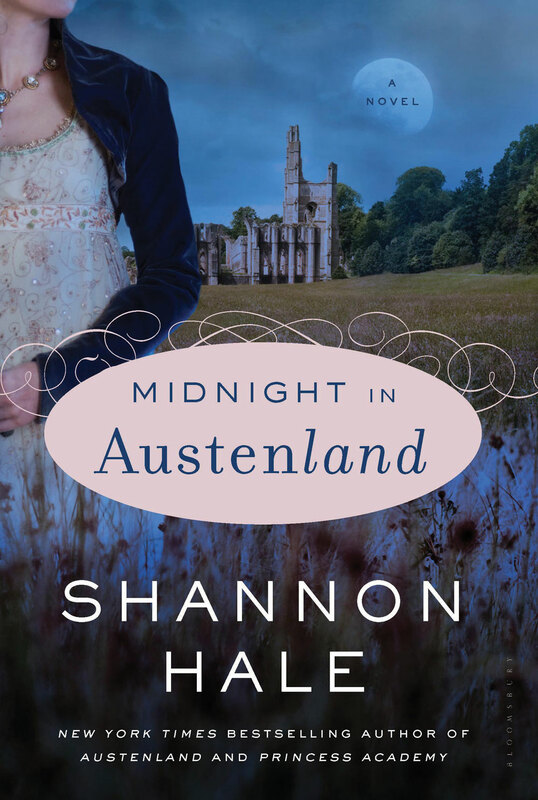 I really enjoyed Shannon Hale’s other Austen-inspired book, Austenland, so I was really excited to return to her Austen adventures. Alas, it wasn’t meant to be. I didn’t enjoy Midnight in Austenland nearly as much as the original. Taking its cues from Northanger Abbey, this book has a Gothic feel. But it’s nowhere near as awesome as Austen’s first novel! Austen wrote Northanger Abbey as a parody of Gothic fiction. By comparison, Hale’s book takes itself just a little too seriously. It’s like every “clever” line had to be included, even if it didn’t fit in at all. And there were definitely a few moments I wondered why there wasn't a little more editing. The whole thing seemed too clichéd. I didn’t care very much about the main character, and I wasn’t invested in the whole mystery. I didn't hate this book, by any means, but it just didn't live up to my expectations. I was disappointed because I wanted to love this book! If you’re still thinking about picking it up, make sure you go in without expecting it to be anything like Austenland. Maybe you’ll enjoy it more if you aren’t comparing it to its predecessor! "Here's the thing about home: you can create it most anywhere, as long as you gather your people around you." I love Shannon Hale, and I love Jane Austen. So, why haven't I read the Austenland books yet? I have no idea, but clearly I need to fix that. Sorry you didn't love Midnight at Austenland as much as the first one. You should definitely read these books! If you love Austen, you'll definitely be predisposed to like these books :) Yes, this one wasn't my favorite - but it was still enjoyable! Just don't expect the two to be just alike and you'll be better off than I was going in to the second book. I recently reviewed this one too. I reallly liked it actually. But funny enough, I haven't read or listened to book one yet. I wonder if that contributed to it. I do love ghostly Gothic things and mysteries. Yeah, I wonder if I would have liked it better if I hadn't already read the first. I think that definitely clouded my opinion. And I read it after two AMAZING books, so I think that had something to do with it, too. But read Austenland! It's really fun!